We’re going to discuss something here now that usually isn’t a huge topic of conversation this time of the year, but should be! As a full-service home services company, we’re happy to share efficiency and money saving tips with our clients. As such, there’s one electrical service you can invest in that will help with another area of your home—your HVAC efficiency! We’re talking about the installation of ceiling fans in your home, from a professional Waterloo, IA electrician. 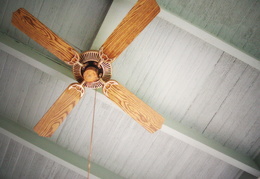 Keep reading to learn more about how exactly ceiling fans help with your comfort and your bills. And if you’d like any further information, please reach out to us any time!